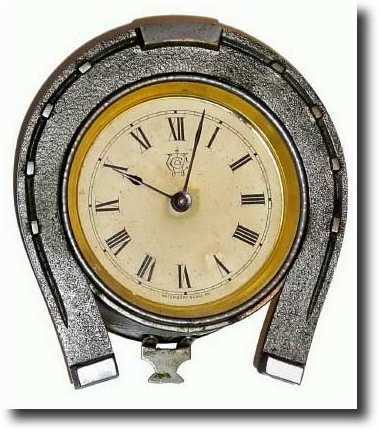 C.1890, Waterbury clock Co., DERBY, shelf clock one day novelty in the shape of a horseshoe, and in very good original condition, nickel finish. The only items that keep this from being excellent are a new loop through the winder and some minor dings along rear edge of case. The original paper dial has some tiny age spots, and some oil at the center, but is very good as well; Waterbury logo is sharp. This model is illustrated in Ly's 2001 Waterbury book, page 516, no. 1973 with a value of $250. Height 5"